In this part 5, Kelly proclaims stretching is dead. Lengthening the range of motion around a joint is alive and kicking, but you don’t get there from stretching (at least the old fashioned way). With PNF, you create peak tension around a joint, then release and lengthen. The result is much more effective than standard stretching techniques. This is the fifth of a series from Kelly on the theory and practice of stabilizing the midline in functional movement. Sounds like "Muscle Energy", an Osteopathic principle developed over a century ago by A.T. Still (founder of Osteopathic Medicine). Great to see this concept making its way into CF training. good stuff...many of us martial artists have been hip to PNF for years now...its great to see it getting press in the crossfit world. Midline stabilization... really enjoyed it... essentially good posture... I look a lot better on the chairlift now... erect spinal cord... you can imagine. I'd like to hear more bout PNF... is there some suggested reading? I have to say this training/tutorial is very enlightening and even I tend to see the differences between when I first started and now. Pavel makes it seem that PNF is his gift to the world. He describes it well, but as Kelly puts it, PNF has been around forever, and anyone that was ever successful at stretching others has used. I love the analogy of a deadlift to the hamstring stretch. I'm surprised it never occured to me that bodyweight resistance is not going to do anything to a muscle capable of lifting 300+lbs off the the floor. There's some good info about stretching there. Good video, good info. I like it! I've always done PNF but I'm running into people that are proponents of AIS. I don't see a difference in ROM with AIS. Anybody have a different response. Great stuff Kelly. It's helped with all my lifts. The funny thing about this is is I was doing my post Cindy stretching when I was watching the video. I stopped and am now looking up how to do some not stretching. PNF is an old technique that most PT's, and DC's have been using forever. Pavel didn't discover it. The really cutting edge stuff is done by activating the muscle that are turned off. That is really causing the tight muscles. you do this within a couple seconds just by stimulating certain parts of the brain. via occular release, a spinal adjustment, cold laser, A.R.T., eyelights, even using tuning forks on specific muscles or nerve levels; aka Chiropractic Neurology. A strong muscle is one that facilitate all its muscle fibers (this only done when its relaxed like a sprinter). The Bulgarians prove this with the wave method. Any how it is a good source of info... presented very well. Thanks. Lots of good information, but I did have two questions. I had been told before that part of what seperated PNF from CR, CRAC and all the other alphabet soup of 'Not Stretching' was that it was done in pairs. Cycle back and forth between hams and quads... was I misled? Is this just an obvious extension of what you were saying? My other question is what are your thoughts on 'Resistance Stretching', similar logic to PNF but requiring a full range of motion? Is this an improvement or just a lot of hype since Dara Torres started advertising it? Good article. Now, how do I use PNF to release my hip and get rid of the popping/catching in said hip when I bend over then stand back up. My lower back is out of whack due to it. 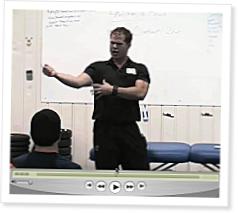 The entire series of Midline Stabilization videos are terrific. As an exercise physiologist I am very aware of what Kelly is addressing. This is vital material for any CrossFitter that doesn't have extensive training and background in exercise phyisology especially if they choose the path to train others. Much of it gets addressed piece by piece in learning the lifts or other CF movements. Kelly gives one a grand review in this series. Part 1 of the series is an outstanding display of the function and how to address the typical dysfunction of the trunk muscles. Understand this and the why's and hows of everything begins to fall into place. Great video! Is there a preferred frequency to see best results for non-stretching? Do you do this everday? Every other day? Once a week? So how do you put this into action? Example pls. I work with two MAT specialists and have attended the three Jumpstart seminars. I am a big proponent of this method and how it looks at the body. If you are Cross Fitting, lifting weights, doing Pilates or anything else you never really know what it is doing to your body until you test. And MAT provides a check and balance system ensuring you are stable in the most extreme ranges. I am a firm believer that CrossFit and MAT go hand in hand. Because many of my clients are not able to keep form going into an air squat the way it is prescribed, MAT has provided me a tool to test and treat to find out where their imbalances lie. It is worth looking into and seeing for yourself. So where can I find some information about this MAT stuff? It really seems like the way to go. So I read some M.A.T. stuff online and it sounds a lot like massage to me without a clear definition the differences. I mostly understand that tightness is the body's reaction to a weak muscle group but is there a way to practice M.A.T. without having to pay a specialist? Another question I have relates to the "activation" of the target muscle group in PNF. For example, when I squat, I can't feel my hamstrings activate at all to pull me out of the squat. I am never sore in my posterior chain as a result of squatting during a WOD and can only achieve a posterior chain soreness through massive amounts of lunges. If I am supposed to activate my hamstrings for 10-20 seconds during a PNF stretch before relaxation, how do I know that I am activating the right muscle? My quads seem so overdominant that they are completely repressing any hamstring activation. Anyone have any ideas about how to achieve a good hamstring activation or be sure that the hamstring is being used? Knee pain seems to be the bane of my existence and I'm getting the feeling that it is all relating back to this issue of lower extremity tightness. I hope disucssion on this topic will continue. Great information as I am always looking for techniques to improve performance. Quick question...is anyone out there familiar with fascial tissue stretching? My understanding, although rudimentary as I haven't delved very deeply into the subject, is that the fascial tissue is tight against the muscle and by stretching it you create space, thus allowing the threshold to increase (ever so slightly) each time which eventually allows for a greater range of motion. Is this basically the same thing as PNR or is completely different? Jay, when you squat are you driving your heels into the floor with your eyes straight out or slightly up? Are you flowing straight up or feel like you are leaning forward? I can feel the hamstrings fire when I drive my heels into the floor. I'll try and concentrate on the heels more and try to feel it. Typically what happens, although I am getting better, is that at the bottom of my squat, since my hamstrings are too tight to allow any further depth, my lumbar spine rounds out to compensate and my torso tips forward and my quads take over. If I were to do 5 fast (tabata speed) squats, I could really feel it in my quads but not hammys. As I stretch more and more and have someone watch me stretch, My lumbar is rounding out at a lower and lower point so I think that is a good sign. Some people really seem to have a very clear feeling in their posterior chain when they squat and I'm trying to get there. Thanks for your help! When stretching the hamstrings lying on the ground, use a towel/abmat under the lower back and focus on maintaining a neutral spine. If one stretches the lower back instead of the hamstrings, it's probably worse than doing nothing. As far as feeling the activation of the hamstrings: put your foot on a box jump, ledge, stair, etc. Digging your heel into the box like you're trying to rip it through to the ground will contract the hamstrings. The same principle applies for when you're stretching with a strap. Question: Are peak contractions supposed to be ramped up to in 5 seconds, or are the 5 seconds like a light switch w.r.t. muscle force? Dont agree with him thou. He says stretching doesn't work on badass muscles but why do I experience huge differences when stretching and not stretching. should we have to maintain this midline tightness in all the crossfit movements all the time during exercises?i am asking as it is pretty hard.please reply guys.